Proud of having such a role model as his grandfather Nicolau Casaus, Jordi Cardoner i Casaus has kept a bond with the supporters movement since childhood. More than fifty years later, Cardoner has been able to take this sentiment to a professional level as first vice-president of FC Barcelona and as the head of the club’s Social Area, which includes relations with and support for the Barça supporters movement as well as providing attention and services to members. 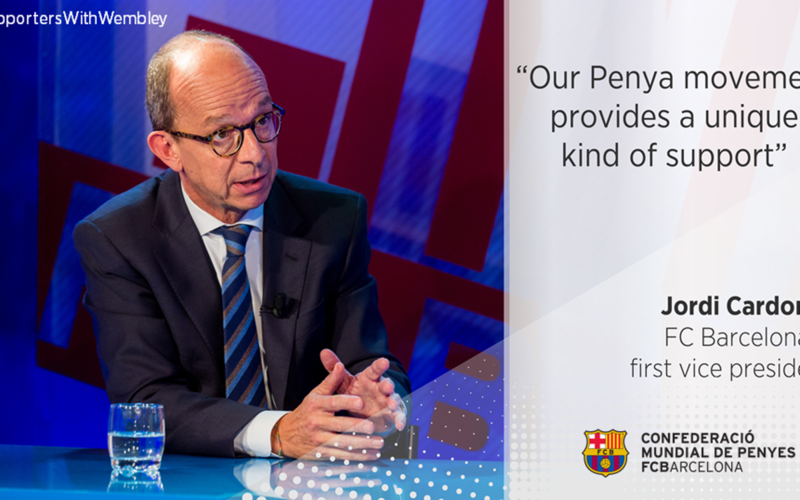 As vice-president of the FC Barcelona Foundation he is also at the forefront of the social and fundraising work that the club performs internationally and that offers a unique added value. His functions now also include being the director responsible for the events to commemorate the 25th anniversary of the Wembley ’92 final. What would you highlight about the 25th anniversary of Wembley ‘92? To begin with, the expectations that Barça supporters took into that final and which meant positioning our club as the top one in Europe. In Barça history, the ‘Dream Team’ meant many things: hope, expectations and the rediscovery of something that hadn’t existed at Barça for some time. Those people, with that major title as the first great achievement, were starting a new way of conceiving football by the hand of the sorely missed Johan Cruyff. Beyond winning such a long-yearned title, what did the conquest of the first European Cup mean to you? It was not just the club’s first European Cup, it was also a huge success for the city of Barcelona. And that success came in the same year we were hosting the Olympic Games, setting a new record for participation and impeccable organisation. What effect did that first European Cup have on the FC Barcelona supporters movement? For our movement that final was a major boost. Real Madrid supporters were majority all over Spain, but from 1992 we have cut down that lead to the extent that we now have more supporters than any other club in the world. It did not only increase the number of members, but also had a very strong positive impact on the supporters movement. What do the penyes do for Barça support? Our Penya movement provides a unique kind of support. The major demonstration of that was the Cup Winners’ Cup Final in Berne in 1979, when 30,000 travelled mainly in coaches organised by several Penyes. The strength of the penyes and the work done by the Federation are two clear examples of its social might. Are these the two most important factors for making us more than a club? This area concerns club members, in hand with the supporters clubs, along with the incorporation of our charity awareness that has been channelled through the FC Barcelona Foundation. For many years, ‘More than a Club’ had highly political connotations, but it also includes a major social component nowadays. We are currently the best club in a sporting sense, but there is no doubt that we shall always be the best club in the world in social terms because we are unique and we are different. ‘More than a Club’ implies major social and solidarity concerns.